IBM delivered on the DARPA SyNAPSE project with a one million neuron brain-inspired processor. The chip consumes merely 70 milliwatts, and is capable of 46 billion synaptic operations per second, per watt–literally a synaptic supercomputer in your palm. Along the way—progressing through Phase 0, Phase 1, Phase 2, and Phase 3—we have journeyed from neuroscience to supercomputing, to a new computer architecture, to a new programming language, to algorithms, applications, and now to a new chip—TrueNorth. (iii) can be specified and trained using backpropagation with the same ease-of-use as contemporary deep learning. This approach allows the algorithmic power of deep learning to be merged with the efficiency of neuromorphic processors, bringing the promise of embedded, intelligent, brain-inspired computing one step closer. A) Two layers of a convolutional network. Colors (green, purple, blue, orange) designate neurons (individual boxes) belonging to the same group (partitioning the feature dimension) at the same location (partitioning the spatial dimensions). 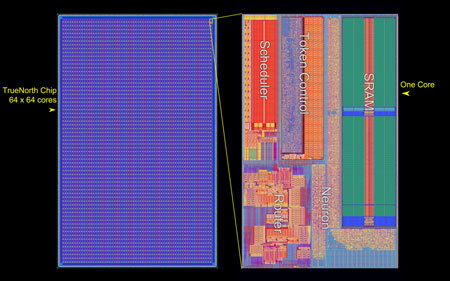 (B) A TrueNorth chip (shown far right socketed in IBM’s NS1e board) comprises 4,096 cores, each with 256 inputs, 256 neurons, and a 256 ×× 256 synaptic array. Convolutional network neurons for one group at one topographic location are implemented using neurons on the same TrueNorth core (TrueNorth neuron colors correspond to convolutional network neuron colors in A), with their corresponding filter support region implemented using the core’s inputs, and filter weights implemented using the core’s synaptic array.